Steel frame for high stability! Whether for your piano, digital piano or keyboard: the MUSIC STORE offers a large selection of piano benches and keyboard benches of all price ranges. From an inexpensive keyboard bench to high quality workmanship piano benches from all leading manufacturers, you will find a wide range of products and services. In our exhibition you will find a selection of all well-known manufacturers such as Fame, Burghardt, EMD, König & Meyer or Stagg. No matter if acoustic piano, grand piano or digital piano, the right piano bench is an important part of making music. On the one hand, of course, the appearance plays a role here, and the piano bench should of course match the instrument. The choice of colours and the upholstery should match the instrument, regardless of whether it is in black matt, high gloss, white or different shades of brown. Just as important is the correct sitting position when playing the piano. An infinitely variable adjustment of the piano bench, as with the Fame PB-10, is an indispensable criterion. The quality of the mechanics determines the quality of the bank. As well as different covers like fabric, imitation leather or genuine leather. Just as with the piano, the appropriate seating is of great importance when playing the keyboard. 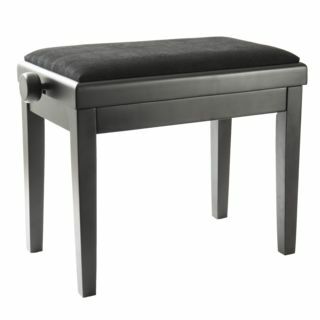 In contrast to the piano bench, the focus of the keyboard bench is usually on the best possible mobility. The weight plays a major role in this, without sacrificing quality. The selection of keyboard benches ranges from the simple bench, which is usually not very height-adjustable, to the high-quality bench with a large seat. 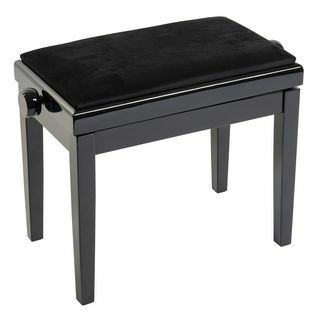 The shape of the seat does not play a decisive role here, whether rectangular, in the case of Musicstore BN-1, or in round form, as for example with the König and Meyer 14092 keyboard stool. The difference in the quality of a keyboard bench is the possibility of height adjustment. 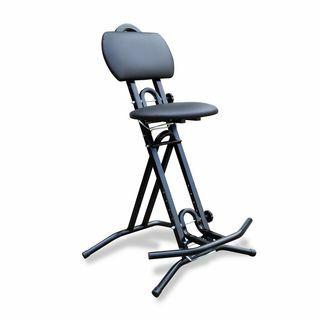 While the simple keyboard bench, which meets the requirements for home practice, is mechanically adjustable in 4-6 units, high-quality keyboard benches have a stepless hydraulic adjustment facility. 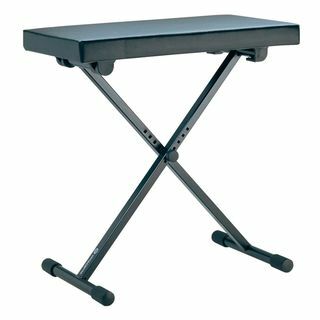 The ambitious stage musician often uses a standing aid like the Stagg MT-300 instead of a keyboard bench.